Lake Baikal has 52 different species of fish among which sport fishing interests are grayling, pike and perch. 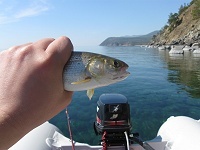 Baikal summer fishing season starts on the 20th of May and lasts until the first snow in october. 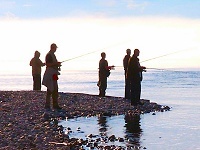 The geographic area of 30 000 square km with 330 tributaries rivers joining the lake offer a variety of unique fishing opportunities. The best fishing experience takes place at the northern basin of Baikal - the part of the lake where there is no way to travel by land. It takes 2-3 days to get to those shores from Irkutsk. Duration of fishing tours varies from 4 to 14 days. Best season is after ice-out, fish roam the shoreline shallows and reefs. Angling, jigging or mooching - all our fishing tours and charters are a combination of trips to enjoy a complete Baikal fishing experience in a single tour. We offer Grayling / Pike / Purch combo charters. 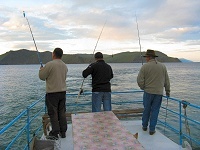 If you plan a Baikal fishing tour, you want an experienced well-seasoned guide. Someone who knows the best time and place to fish. A guide who knows these waters thoroughly. BaikalExplorer has seasoned and friendly Baikal fishing charter captains who will make your Baikal fishing trip a pleasure. For 1-2 persons we offer an inflatable 4.5 meters SIB Heavy Duty: camping trips from 2 to 5-7 days. All fishing and camping equipment including tents and sleeping bags is provided. For bigger groups and/or fishing charters we offer 24-metres long diesel-powered Yartoslavets-class charter boats. You can read more and see the photos of these boats here. We offer Yaroslavets not only because they are perfectly matched to the query we target but because it is nearly the only option of liveaboard available on the lake. Our boats are kept exceptionally clean and well maintained. They offer full walk-around fishing deck, one shower, toilet, caboose and 2 enclosed heated cabins with 4 sleeping berths in every cabin, for 8 passengers maximum. Fishermen shall bring their own light fishing tackle and/or medium-weight spinning gear (rods, reels and lines). Rods: 4.5 - 6.8 kg (10-15 lb.). Reels: for 0.40mm/100m lines (LBS/YDS 12/130). Two types of lines: 0.25mm (6 kg / 13.8 lbs) and 0.40mm (13.5 kg / 30 lbs). Your favorite bucktail jigs, crankbaits and flashy spoons. Special flyhooks, set of sinkers and float/bob (required for Baikal grayling angling) can be found only in Irkutsk city. You can use jigging to catch grayling and/or any other commercial fish of Baikal. Irkutsk fishery stores offers best selections of fishing tackle and related equipment for fishing in lake Baikal. On arrival day, our service makes a stop at a local fish store en-route to the boat so you can buy additional tackles if you desire. • For those susceptible to motion sickness, taking motion sickness medication is recommended. Be sure you take everything you need. There are no shops on the lake. The last chance to buy things and tackle is in Irkutsk. Upon your request during the transfer we make special stops at any shops and markets. It is forbidden to catch Lenok, Grayling and Taimen during the spawning period: 25 April - 25 June. The average lifetime is 8-10 years, maximum - 25 years. Average weight: 300-350 g / length: 30-35 cm. Maximum weight was 5 kg. The total biomass/weight of omul in Baikal is estimated to be 260000 tones. There are several ways to catch this fish: the 1st and the most popular way is the winter ice fishing. The second and more complicated way is called "na faru". This is a summer night fishing using a torcher. Local people fish with nets all year round. It is the most common fish, spread all around the lake. It runs near small mountainous rivers inlets and rocky-bottom shores in depths of 30-50 meters. For successful fishing you can try both angling and jigging. Black grayling, as well as Taimen, provide a modest fight and are good to eat when pulled fresh from the lake. Average lifetime: 6-9 years, maximum: 12 years. Average weight: 350-400 g, average length: 35-40 cm. Maximum weight: 1.5 kg., maximum size: 45 cm. During Baikal fishing trips, anglers may also find themselves hooked into a mighty Baikal White Grayling that has been cruising the coastline in search of food. Average lifetime 7-10 years. Average weight - 500-600 g., size 40-45 cm. The maximum weight 2-2.5 kg., the maximum size is 50 cm. Lives on sandy soils in depth down to 30-50 meters. Listed in "The Red Data Book of Buryatia". Fishing technique is the same as for black grayling. Average lifetime: 10-15 years, maximum: 18-20 years. Weight is 500 gr. at the age of 5 years and 3-5 kg at the age of 15 years. Lives where the bottom is sandy in depths down to 200-250 meters. These monstrous fish are extremely strong and display impressive jumps during battle. Its lifetime is more than 60 years. Maximum weight is 120-130 kg at the length of 180 cm. Listed in "The Red Data Book of Russian Federation" and in "The Red Data Book of Buryatia". Inhabit large, fast flowing, shallow and cold rivers. Its average weight is 2-3 kg, length can be up to 1 meter (40 inches); Average length is between 40 to 65 cm (16 to 25 inches). Main food: insects (aquatic and terrestrial), caddis, mayflies, mice, small fish. For fishing we use light fly tackle, mice patterns, streamers, hoppers, floating lures. Perch and huge Pike fishing is best at Chivirkuysky Gulf. The wolrd's largest freshwater species of the salmon family. It lives in large rivers and tributaries of lake Baikal. Main food of Taimen: rodents, lemmings, mammals, birds, mice, smaller fish. Lifetime - more than 50 years. The maximum weight is 90-100 kg., the maximum length is about 200 cm. Listed in "The Red Data Book of Buryatia". Taimen inhabit the very north of lake Baikal. Successful fishing requires at least one day of searching around. Heavy tackle and a mice on a hook are used for fishing. Best Baikal fishing seasons are May/June and September/October. Spawns in May. Other fish like eel-pout, ide (Leuciscus idus), roach (Rutilus rutilus), dace (Leuciscus leuciscus), minnow, bream inhabit warm shallow bays and gulfs of Baikal. Whether you are a seasoned angler or a novice, we will work hard to see that you savor the same pleasure and thrill. We will give all our effort to put you on fish and make your Baikal fishing holiday successful. Contact us to book the best season for your Baikal fishing vacation. We will be glad to answer all your questions.